I didn't post for a while but kept rowing the past weeks. I have made it to week 24 of the BPP so really close to the end Two more rows and it is done. The past weeks were pretty straight forward and went quite well. 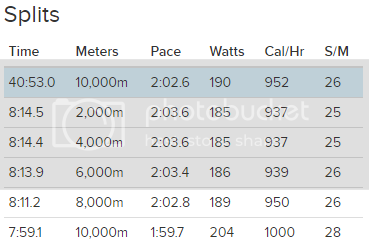 The plan asked for a TT on the 10000m in week 23 so I gave it a go. The previous best was 41:12.6 so my goal was to finish within 41 minutes. My time was 40:53.0 with an average pace of 2:02.6 which felt pretty good. Started BPP 06/08/2018 @78kg and Finished 09/02/2019 @75kg. Back on the Pete's Plan Wagon! Between work travel and prioritizing my climbing days, it's been two and a half days since I've rowed, and I've only done the SkiErg intervals. Nine climbing sessions and three strength training sessions managed - but that isn't moving my rowing forward. it was pretty painful to do 6000m today. I was a minute and a half slower than last time, sigh. Pretty sure this is my first post so i'll bore you all with some intro. apologies in advance for the length of this post! Generally pretty active, and do other sports - not just rowing. Used to row when i went to the gym, but bought the bullet a year or so ago and bought a model D so i could put a little more time into exercise in general. 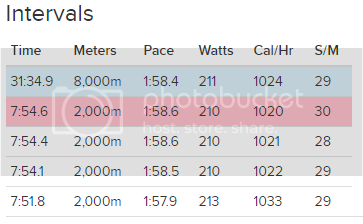 Started off just rowing when i felt like it, about 2-3 times a week, with a mix of 5k's, 2k's, pyramids, and short ~30:30 intervals, x 4 with 3 mins in between. Eventually got a little bored of this and wanted to reduce my waistline, and get my 5k under 20 mins. So i cut down on carbs slightly, and did my own version of the PP 5K plan which was 3 sessions a week with 1 distance and 2 intervals. Got good results up until i got ill, had to take a week or so out, so had to go back a bit, then kept missing goals, so ended up fading out. 5k time went from 22:05, down to 20:18, waistline was basically unchanged, but had put on ~3-5Kg. 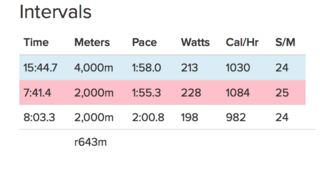 Took a few months off, mainly due to life in general, also the weather was nice, so was riding my bike rather than rowing, realised that aiming for an increase in athletic performance wasn't helping my waistline, but was getting me a lot fitter so changed tactic - went back to beginning and started the BPP. There's still no change to the waistline (maybe tiny amount but barely noticeable) - but weight has gone up another ~5kg. Please note though i'm not fussed about my weight, but i am trying to reduce waistline, i appreciate these aren't always linked!! I am clear that more effort is required on the diet front - so in the new year i started being much more careful on portion size, and have tried to keep things balanced and healthy. Also did dry January (with no effect). Has anyone else experienced this kind of plateau? or frustration in having to repeat weeks without seeing much improvement? Sorry for the length again - and if you got this far well done!! Should have added, also took a week at around week 10 to re train myself. Had been doing the SS rows at a stroke rate of 16-18, do to try and get more cardio benefit upped this to 21-24. Worked out great and since then the longer stuff was seeming easier. 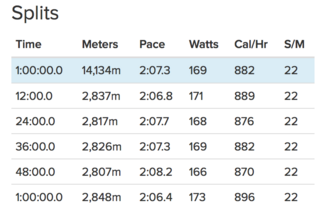 Although must as another add on, the anaerobic hiit intervals have always been easier for me than long distance, slow pace stuff. Thanks for the reply Rod, but no, damper setting has been between 5-6 the whole time, works out to a drag factor of about 120-130. BPP week 5. 7000m done at 2:18. 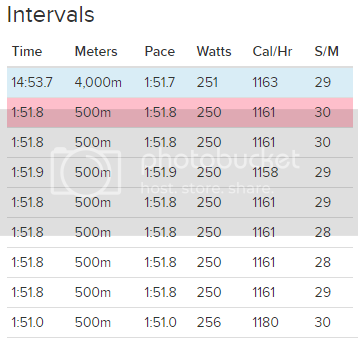 I've gone back to using my HR monitor and kept my rate between 140-145 for this session. Good luck in breaking the plateau, I can imagine it must be tough repeating the weeks over and again. I like the consistency of a training plan to give me pieces to aim for and achieve, I shall see how it goes from here on in. It looks like you were getting quite a good 5k time there. 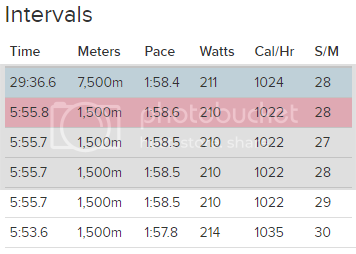 BPP 3.1 - 06/2/2019 - 6000m - Set out to do a steady pace around 2:08 - practice for the valentines challenge. 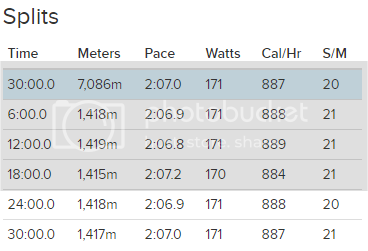 BPP 3.2 - 07/2/2019 - 2 x 2k r4' - Struggled to keep pace on the 2nd piece, but overall an ok average. 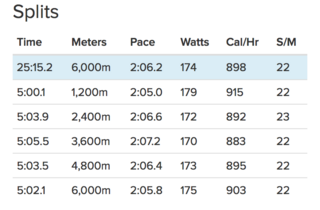 BPP 3.3 - 09/2/2019 - 6000m - Set out to match the pace I did on the earlier 6k. After a few weeks off to compete in my first rowing race then do a HM TT, I'm back on the BPP for the SkiErg. Since it had been a few weeks, I re-did the 5500m. Yes, I have finished the BPP last week! Really happy with the milestone. I feel way more fit than before the plan and went down from 78kg to 75kg. 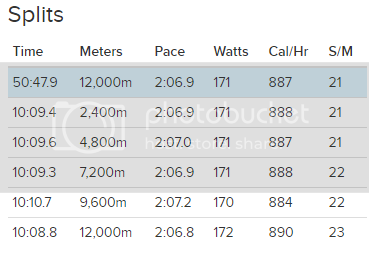 At the start of the plan I managed to row 2000m in 8:32.1. Last week I tried again and I managed to do it in 7:19.4. Pretty good progress. The plan is now to switch to the Full Pete Plan. This plan consists out of 6 rows a week but for me I can only do 3 rows a week. I will spread out the 3 week schedule over 6 weeks. Does anybody do the same? Would that be a good idea or are there any major downsides to this? Congrats Roel! Great work. Really good pacing on that 2k as well. Rob, 26, 6'2", South London, new to rowing. Started BPP 16/07/2018 @104kg. Finished 18/01/2019 @86kg. Congrats on finishing and the 2k!! Excellent pacing. Roel, congrats! Nice progress. If you're going to do the full PP, I'd try to do five days a week if you can. If not, then do the two hard interval workouts and one longer, slower piece. It wouldn't be the true PP, because the full PP is made to add "stress", lots of it, to ready you for a race. That 10K was very nice. Do what you can fit in. If it's not the true PP, that's OK, better than nothing, that's for sure! I'm out with my back again, sadly. I'm actually working hard, just all on the Air Dyne Pro. I'm actually doing the 5K PP, essentially, but on the Air Bike. Hope to be back to rowing in a month or two. Nothing that painful, but every time I try to row, it reaggravates the back. Longest I've been away from rowing in five years. I'm sure I'll be back eventually. Just wanted to come on and congratulate you Roel! Week 6 BPP. Use my heart rate monitor on this 7500m row in an effort to keep my HR between 130-140. This resulted in a 2:19 pace for the piece. 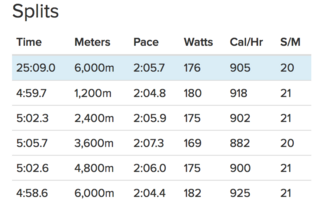 This really got me thinking about my pace for my long steady state rows this past year. 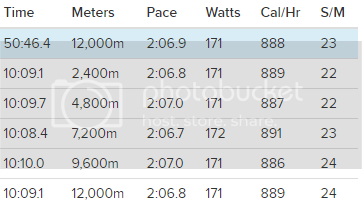 I'm wondering if my typical 2:15 pace has just been a bit too fast. 5000m done today at the gym at 2:14 as a bit of a warm up before my weight training. 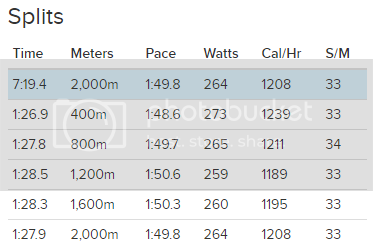 Not really sure how to pace my upcoming 3 x 2000m, r4 for the BPP this week.